Princess Peach is most popularly known as the love interest of Mario and Bowser. After all, Bowser loves kidnapping her. That is the reason why Mario keeps rescuing her as well. But being a damsel in distress isn’t the only trait of this princess! She is also loyal, kind, and very ladylike. Princess Peach is also known for her love for the color pink. In fact, her ball gown is made from different shades of her favorite color. She also wears hot pink heels and white ball gloves. 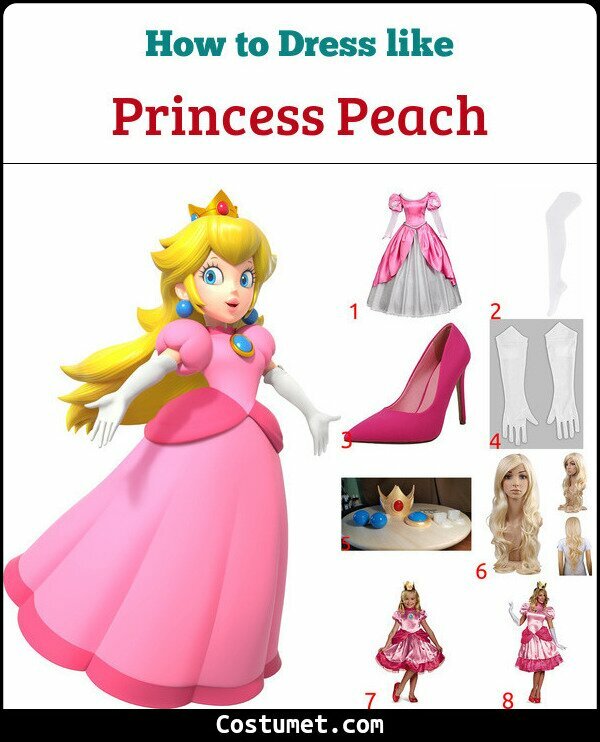 Here’s everything you need to look like Princess Peach. 1 Pink Ball Gown A regal monarch like Princess Peach deserves a beautiful ball gown in her favorite color, pink. 2 White Stockings Since Princess Peach moves around a lot, it’s prudent to wear white stockings. 3 Hot Pink Heels Princess Peach pairs her pink ball gown with hot pink heels. 4 White Ball Gloves Princess Peach’s white ball gloves level up her outfit royally. 5 Blue Earrings, Necklace & Crown Princess Peach also loves wearing round, light blue earrings and brooch. Being a princess she also wears a crown. 6 Long Blonde Wig If you don’t have the same color of hair as Princess Peach, you may want to invest in a long, blonde wig. 7 Girls Costume Set Transform your little girl into Princess Peach with this awesome costume set. 8 Costume Set You can be the Princess Peach to your hubby’s Mario with this costume set. 9 Deluxe Costume Set Want to be extra glamorous? Get this deluxe costume set! Princess Peach has been voiced by a lot of actresses throughout the years since her debut. However, the current voice actresses portraying her are Samantha Kelly and Mikako Takahashi. Kitana has had many outfits throughout the series but the most popular one is her regal, cerulean colored attire. This showcases a beautiful halter top with a black crisscross design in the front, a very short thong with a long loincloth in the front, knee-high boots, and her Steel Fans.